Below is merely a sample of historical K-car videos and commercials, with lots of memories for those of us that grew up in the 1980s. There are even more videos uploaded by our members of their cars, club events, and more commercials on the networking site. Brand new 1982 Dodge 400 Coupe! The 1983 Dodge Aries/Plymouth Reliant Canadian car commercial in French. The 84 LeBaron rides again! Lets try to drive a Reliant up a hill on dangerous ice. 84 Reliant gets hoseblasted in an automatic carwash. Lee Iacocca's vision for Chrysler cars in 1985. 82 Chrysler commercial with Dodge 400 4dr Sedan. RARE 1986-1988 Chrysler LeBaron Town n Country Wagon Turbo! Lets call this: Duct taping a K car. Turbo 1988 Dodge Aries 4dr Sedan. The 1984 Chrysler LeBaron Convertible with Ricardo Montalban commercial. 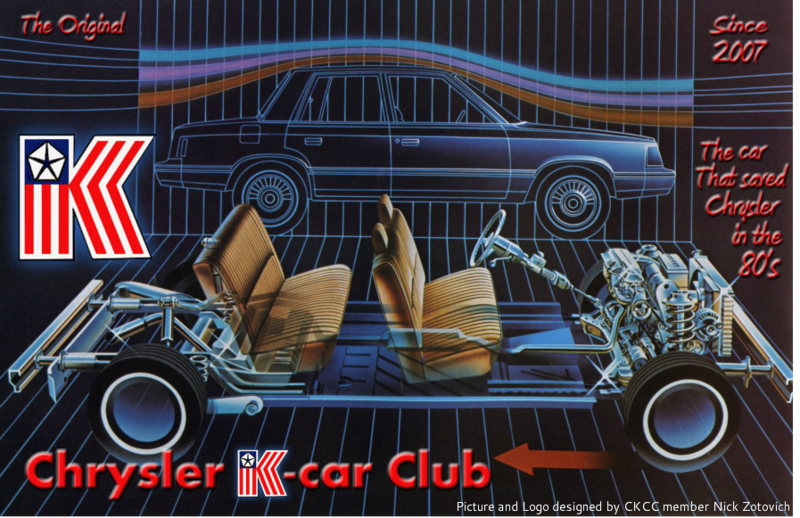 Talking 1986 Chrysler New Yorker Turbo K Car, for those four videos. It is a man starting up his car and giving us a tour of the 80s Chrysler electronic computer talking system. K Car Rally. It is about some farm kids that take a beat up Aries coupe and fill it with tractor fuel to jump grassy hills. Kids driving an 87 Aries in slick, wet condtions in the rain. Man test driving an 84 Reliant at 80mph on a racetrack. Pretty cool! Ricardo Montalban's other Chrysler New Yorker commercial. Someone racing their K car in mountain terrain.